Super Celebration: Patriots To Spike The Ball At The White House President Trump will host the Super Bowl champion New England Patriots at the on Wednesday. The president has strong ties to the team. But some players are boycotting, saying they don't feel welcome. New England Patriots quarterback Tom Brady holds the Vince Lombardi Trophy beside coach Bill Belichick, after the Patriots defeated the Atlanta Falcons 34-28 in overtime at Super Bowl 51 in Houston. President Trump is set to host the Super Bowl champion New England Patriots at the White House on Wednesday, an event that brings together some of the most polarizing figures in both sports and politics. 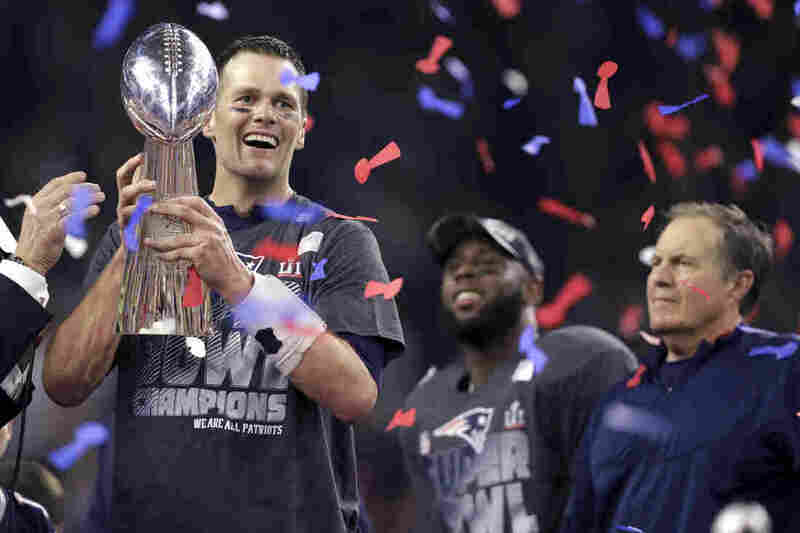 The Patriots are well-acquainted with this championship ritual, having won five Super Bowls in the last sixteen years. But their come-from-behind win over the Atlanta Falcons — after being down 25 points — was every bit as unlikely as Trump's own upset victory three months earlier. The president himself left a watch party at his Florida golf club during the Super Bowl, after New England fell behind 28-3. He was as surprised as anyone by the turnaround that followed. "What an amazing comeback and win by the Patriots," Trump tweeted. "Tom Brady, Bob Kraft and Coach B are total winners. Wow!" Trump is a longtime friend of the Patriots' quarterback, owner and head coach, so there will be plenty of smiles when they pose for commemorative photos at the White House. At least a half dozen team members are boycotting the event, though, with some saying they don't feel welcome so long as Trump is president. The White House has indicated that the event is going forward, in light of the death of former Patriots player Aaron Hernandez in prison. Corrections officials say Hernandez, who was serving a life sentence after being convicted of a 2013 murder, committed suicide. Brady said he cannot attend today's ceremony due to a family matter he needs to attend to, according to a statement obtained by ESPN. He skipped a White House visit in 2015 — the team's only win during the Obama presidency. The quarterback did celebrate three earlier victories with George W. Bush, though. And he visited the Clinton White House as a college player after the University of Michigan split the national championship in 1997 with the University of Nebraska. "It really is a great experience," Brady said, according to the Boston Globe. "Putting politics aside, it never was a political thing. At least, it never was to me." Some of Brady's teammates don't share that view. "I'm not going to the White House," defensive back Devin McCourty told Time Magazine. "Basic reason for me is I don't feel accepted in the White House. With the president having so many strong opinions and prejudices, I believe certain people might feel accepted there while others won't." Defensive end Chris Long, running back LeGarrette Blount, linebacker Dont'a Hightower, defensive tackle Alan Branch, and tight end Martellus Bennett also planned to skip the celebration with Trump, according to Bleacher Report. Team owner Kraft says players are free to make their own decision. "This is America," Kraft said on NBC's Today show. "We're all free to do whatever's best for us. We're just privileged to be in a position to be going." The ties between Trump and the Patriots organization are deep, although head coach Bill Belichick says they have nothing to do with politics. "Anybody that has spent more than five minutes with me knows I'm not a political person," Belichick told reporters, days before the Super Bowl. Trump did quote Belichick on the eve of last year's election, though. At a political rally in New Hampshire, Trump read aloud from a letter the Patriots coach had written him. "You've proved to be the ultimate competitor and fighter," Trump said, quoting Belichick. "The toughness and perseverance you have displayed over the past year is remarkable. Hopefully tomorrow's election results will give the opportunity to make America great again." The Patriots showed their own remarkable toughness and perseverance in the Super Bowl, overcoming a 25-point deficit to win in overtime, 34-28.